You don’t go to Bryant’s for fancy breakfast – there’s not a single frittata or organic spinach omelette on the menu board – you go there for thick, filling Southern breakfasts served with deadly efficiency and mind-numbing speed. And when you go, you’d better know what you want before you get in line – everyone else does, and the ladies behind the counter don’t play. 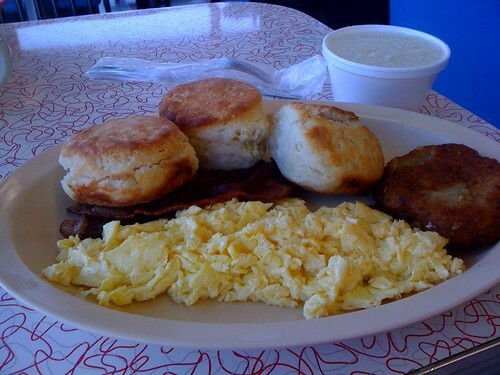 Whatever you order, you definitely want a biscuit. They’re legendary – thick and fluffy with a nice crusty top. They’re good plain, but they’re even better with sausage, eggs and cheese or ham. Their gravy is an absolute must as well. For more about Bryant’s, go here. Bryant’s opens for breakfast at 5 a.m. They don’t take cards, so go to an ATM on the way. The biscuits are SO GOOD! They're so famous for their breakfast that most people know nothing about their plate lunches, which are absolutely phenomenal. The hamburger steak w/ onions and brown gravy is out of this world. I highly recommend their plate lunch to anyone who loves a good down-home southern cooked meal. Looks great; I really like the hearty disguise of the restaurant.